As readers will know from earlier posts, last weekend we refought the Battle of Soor, set during the 2nd Silesian War, at the AMG16 event. This was to be a big multi-player game using Honours of War rules, played to a conclusion on both Saturday and Sunday. It took a while to actually decide finally to do Soor, as it is not the easiest battle to reproduce, but in the end reason was overwhelmed by insanity and the image in my head of around 1500 28mm figures on the table, and the decision was made! When calculating the forces required I decided that a ratio of about 1:3 for infantry battalions and 1:5 for cavalry squadrons should work. The impact on the battle of the Austrian right wing under d'Aremberg was negligible as they made little effort to engage during the day, so with the exception of some cavalry (which I now regret being so generous about including) these were omitted from the Austrian line up. The Prussians were still outnumbered by 3:2 in infantry, 2:1 in cavalry and 5:4 in field artillery. To reflect the superiority of the Prussian infantry I made them all 'superior', while around a third of the Austro/Saxons foot were made 'inferior' to reflect the hammering they'd taken not long before at Hohenfriedberg. The trouble is that whether your little men are 'superior' or 'inferior' or somewhere in between their ability to take casualties is finite. The Allied cuirassiers were also 'superior' but were not allowed to counter charge in the game to represent the tactics followed on the day. There were too many Saxons on the table but overall the proportions were more or less right. I supplied the Prussians and a few Austrians and Saxons while Robbie supplied the bulk of the Austro/Saxon forces. 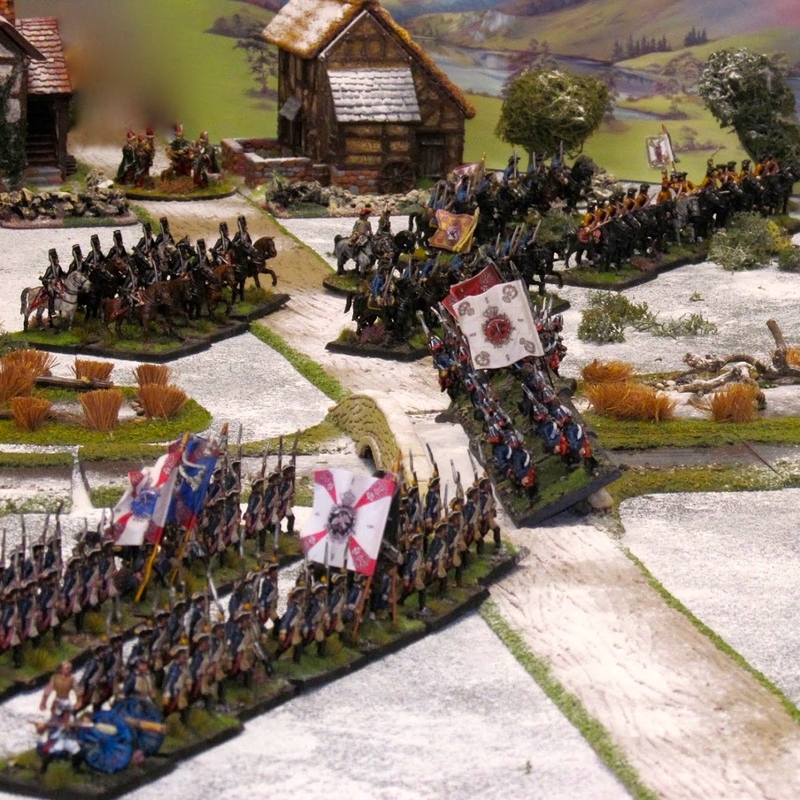 (Initial deployment: On the left the Prussian main body ready to assault the Austrians on the hill. Reserves marching from the camp. Out of shot on the right are 10 squadrons of Austrian horse, facing 8 of Prussian). We were able to set up the terrain on Friday evening which saved some time the following morning. Robbie and I co-umpired, although we provided advice and guidance to the players as well, in the capacity of 'military advisors' to the courts of Prussia (Me) and Austria (Robbie). There was plenty of banter but no examples of partisan umpiring. Few of the players had ever used the rules so it was going to be an interesting exercise as well as an intense game. Austrian left wing cavalry holding their position on the hill. Chris (Charles of Lorraine) and Steve (Hoehnembs) asking "can we do that?" Steve's right wing cavalry rolling ponderously forward. The Prussian camp. 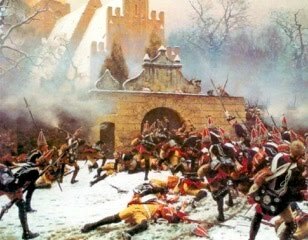 If at any time there were no Prussians between the right table edge and the camp, a unit of hussars would sweep onto the table and head straight for it, intent on looting and plundering. The main body of the Allied army in the centre. Chris managed to throw a '6' for command in turn 1 which resulting in Daun leading his brigade off the hill towards the waiting Prussians, where they were driven off. Gary ordered his cuirassiers and dragoons on his right to attack the dithering Austrians in front of them. 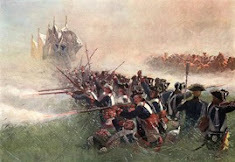 The Prussians needed to get the drop on their enemies in combat as the Austrians were not allowed to counter charge. Mr. Mark Allen pondering how to stop the wave of Prussian cavalry that was pushing his horsemen back in confusion. 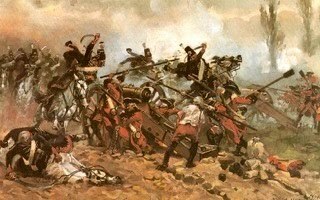 The Prussian assault in the centre was slower than Gary hoped for, and as a result took a pounding from the Austrian artillery deployed on the hilltop. 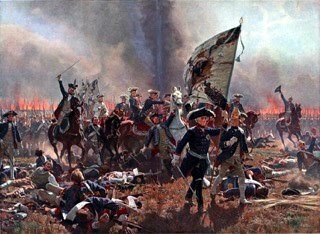 Stuart commanding the Prussian refused left was about to be overwhelmed by the more numerous Austrian horsemen. The Austrian centre straining under the pressure while the cavalry on the flank are pushed back by the tiring Prussians. Prussian and Austrian cuirassiers and dragoons thrash it out on the extreme left. The former are successful in driving off several enemy squadrons but were gradually whittled down by sheer weight of numbers. The surviving Austrian cavalry on their right rallying before restarting their advance. A swirling cavalry melee continued on the Prussian right. The Austrians could never gain the initiative and were slowly pushed back, but were quickly wearing the Prussian squadrons down. In the centre the Prussian advance has come a halt due to casualties and the need to reform shattered battalions. The Prussian centre under Gary (Jeetze) has ground to a temporary halt. Frederick has moved up to encourage his men. Chris put his Saxons into column and advanced them towards, through and around the town. Those in the town invariably got lost, went to the pub and brothels and never emerged from the other end as planned. These Saxons avoided the town but were pounded by Prussian heavy guns and whatever enthusiasm they had for revenging Hohenfriedberg quickly vanished. The Austrian hussars arrived and made a bee-line for the camp and Frederick's whippets! There was a great deal of re-ordering on the Austrian from the left, as damaged infantry attempted to extricate themselves from the path of the advancing Prussians. The Austrian cavalry was battered but the Prussian horsemen were spent, facing as they had been an uphill battle against twice their numbers. Well done to Gary for pressing home the attack for so long. On the Austrian right the infantry under Steve (Weid) trundled forward......slowly. Steve pushed forward with his right wing cavalry and attacked the Prussian heavy artillery battery holding their extreme left flank. All the Prussian cavalry had by now been dispersed on that flank. The Prussians had also occupied the orchard but the Austrian cavalry swung round and despite severe losses overran the Prussian artillery and encampment. A confusing fire-fight developed in the centre between Austrian and Saxons vs the weakened Prussians. Readers will notice a gap where, if referring to the previous photo, several Saxon battalions had been earlier but had since found somewhere better to be after being pounded by the Prussian artillery. The last remnants of Gary's Prussian horse on the right are about to be swamped by the Austrians. A fantastic job had been done by these troops against serious odds. With the Austrian centre about to buckle, a charge by the Saxon cavalry saved the day. The Prussians were too weakened by their struggle up the hill to hold and they were driven back down it again. The Austrian combined grenadiers in a last ditch and successful attempt to drive the Prussians off the hill. After 5 hours of battle, it was the Prussians (much battered) who were first to reach their army break point. The Austrians were trailing them by but a single point so it was a hard fought victory and it could have swung either way right up until the last move. I took command of the Prussians on Sunday, assisted by Ken. 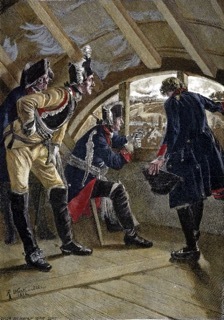 Guy and Co, assisted by Robbie, led the Austro/Saxon forces. My 'plan' was to refuse the left, pin the right and punch my way through the centre. Subtle it wasn't. I also didn't stick to it! The Prussian right wing cavalry sweeps up the hill. A vast column of Austrian horse move towards the outnumbered Prussian left. Turn 1 saw the leading Prussian brigade get a double move, which significantly reduced the number of times the Austrian battery had them in their sights. The Prussian right wing continues to advance, but too slowly. The grenadiers facing the Austrian battery were badly hit and I pulled them back to rally while the rest of the brigade were able to continue their advance. The Prussians drove off the Austrians supporting the artillery and found yet more enemy troops waiting for them. On the left, the Austrians advanced rapidly, which was a concern as we were significantly outnumbered on that flank. On the right the opposing bodies of horse have already clashed and damage has been done, but the Prussians have failed to push the Austrians back. The last Prussian reserves in the centre. Back on the right the dwindling numbers of Prussians struggle to hold the Austrians back. I made an error and failed to charge the Austrians, so they were able to regroup and charge my cuirassiers. When I did regain the initiative the leading squadron above was unable to charge into contact and had to retreat, and the second was hit in the flank by the Austrian cuirassiers and broken. On the left the Prussians gambled on a charge against two rallying Austrian squadrons. It drove them back but failed to break them. In the centre I had driven off most of the Austrians holding the hill but then threw a 6 which meant I had to do a double move and charge if in reach. Doh! So, my centre attacked. One battalion charged the artillery, another the Austrian grenadiers while the last one just moved as far forward as possible to face the Saxon troops at the rear of the Austrian position. Given the opportunity this battalion would have withdrawn as it was down to 3 hits but I had no choice in the matter. I managed to over run the artillery but the attack against the grenadiers failed and my battalion deep inside the Austrian centre was destroyed. The Prussian right before Guy's game winning roll of the dice! All three of these battalions were either destroyed or swept to the rear when his victorious cuirassiers followed up after hitting our cavalry in the flank and rolled them up! The rather large hole in the Prussian centre resulting from the Austrian flank attack. Such a shame as we were still holding on the left and winning the battle around the town against the Saxons. The fight in the centre. The battle seen from behind the Austrian left. The Austrian centre at the end of the game, battered but not beaten. On the brink of victory the Prussian's assault had collapsed, so we had yet another Austrian victory, and a much more clear cut one too. A well deserved victory especially due to my mistake in not keeping the pressure on the Austrian left wing cavalry and running out of troops attacking in the centre. Both games were excellent, and we managed to keep them going at a furious pace throughout each day's gaming. After the game I realised that I'd forgotten to apply some of the troop modifiers specific for this battle but I doubt they'd have made much difference. The Prussians were always going to have to work hard to manage a victory and all credit to them (and me) for piling the pressure on and certainly on Saturday getting so close. Having now played it twice I know how the Prussians can win and I am keen to give it another go soon. The rules worked very well for such a large multi-player game. Thanks to Robbie for providing the bulk of the Austro/Saxon forces and for helping to umpire and 'advise' the Austrians (with varying degrees of effect), and to everyone who took part in the game on both days and played throughout in such good spirits and like gentlemen. Excellent report Colin, and what an impressive game. You obviously had a brilliant weekend. I was pleased and interested to see the rules working OK with your bigger units. Great reports Colin. A very fair representation of the one I was in and interesting to see it from your "Prussian advisor" perspective. I'm afraid all that "didn't the Prussians do well" stuff rings a bit hollow to the Austrian on the wrong end of their musket barrels! A fantastic game so well organised and run. Interested readers might like to see my own report and views here http://notjustoldschool.blogspot.co.uk/2016/06/first-of-my-reports-on-amg-16.html. Thank you too for the insights into scaling down the real battle into HoW style battalions, I did wonder on the day but you and Robbie were too busy keeping us in order for me to ask. Yes, yes, yes! This is how it's done. Great game descriptions and fantastic figures/units/table set-up. I was reading the rules again lat night and noticed that Robbie and I had forgotten to apply the broken brigade rule, I.e. When over half of the units in a brigade are 'done for' then the remainder of the units must withdraw. It wouldn't have mattered on the flanks but in the centre the Austrians and Saxons would have been forced to give ground. I doubt it would have made a difference though in the final result! Fine looking games Colin! It certainly looks as if you enjoyed the weekend. I must say that the based buildings look really good!! Ignore my last. That rule I mentioned is an optional one that we've not played before. Would have made no difference in the long run as the Prussian army had run out of steam.........and men! It would've been a fully justified Austrian success anyway Chris, on both days.